EYE: Has it sunk in yet as to what you are doing? CINDY: No… it’s really crazy. I worked really hard the last year just to get to the starting line of the race through the Alaskan wilderness with my team, hopefully, within 12 days. EYE: Were your lifelong goals to climb Mt. Everest and run the Iditarod? CINDY: Actually neither one was. Ha! I watched a documentary about Mt. Everest when I was 48, and at that moment, I believed I had to climb that mountain when I had never even climbed a rock wall at a gym. Then a couple of months later, I was diagnosed with this disease, got blind in one eye, and was taking all this medication, but I still kept after it. And three years later, I was on the summit of Mt. Everest. Then I was asked what I was going to do next….the Iditarod? And I thought, “That sounds like a good idea.” I had never been on a dog sled. I contacted Lance Mackey—he’s won it four times in a row—and sure enough, three-and-a- half years later, I’m racing in the Iditarod. EYE: What was compelling you to make you climb Mt. 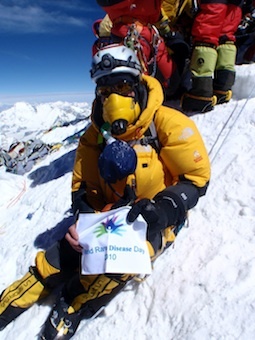 Everest and then persevere after being diagnosed with this rare disease? 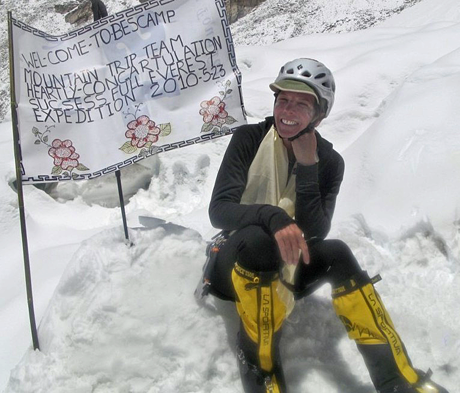 CINDY: I love adventure, the outdoors and experiencing different things. I like challenge and living life. But this race is even harder, something I never thought I would say after 54 days of living on Everest. EYE: What makes it so much more difficult? CINDY: It’s the physical aspect. On Everest there is a support team so they know where you are. There’s no “team” following you in the wilderness. You can go for a whole day and never see any civilization. You are out there with no vehicle or communication devices. We have all the storms, wildlife, navigating, taking care of your dogs, and our gear. We have to endure physical and mental extremes and the cold! We run in 50 below temps, not counting wind chill. Plus, people have trained most of their lives for this race; I’ve only trained for 14 months. It’s crazy! EYE: Are you scared? Nervous? How are you feeling about this? CINDY: I’m not scared because I’m a pragmatist. I’m not nervous either. I’m anxious to get on the trail. On Everest, I went ten feet at a time. Whatever it was, I took tiny chunks; and in this case, it’s each run with the dogs. In my brain, I think I have to get from here to here. EYE: How much does living with this disease affect you now? CINDY: I’m blind in one eye. I have compromised vision in the other eye. I have arthritis in my back that is very severe. I have to take these medications all the time. Now I have this cold. It’s like a repeat of Everest where I was sick for six weeks, and it didn’t get better until I got off the mountain. When I got diagnosed, I read that the time from diagnosis to death was five months! But they’ve extended that because they’ve come out with new drugs, and they caught mine before the kidney and lung involvement. Some people with this disease can’t even walk their dogs. 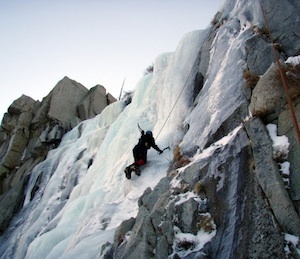 The doctors would say you shouldn’t be able to do this, but I kept climbing bigger mountains and nothing would happen. So they couldn’t tell me I couldn’t, and then when I got to the summit of Everest and came back, I immediately went to the doctors and they were just stunned. I want to use the media to get awareness. That is my mission. 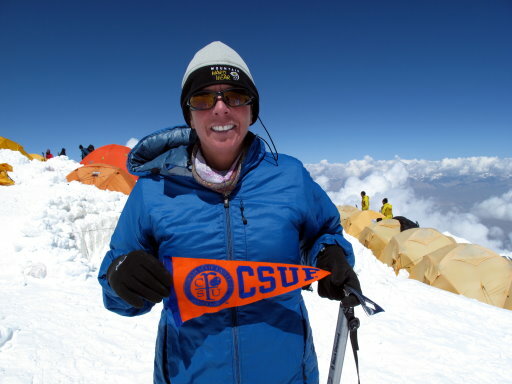 I was the 40th American female to summit Everest. Only 707 people have finished the Iditarod—127 females—so starting to train at age 52 to run this race with my disease, and commuting from California to Alaska, should be impossible. 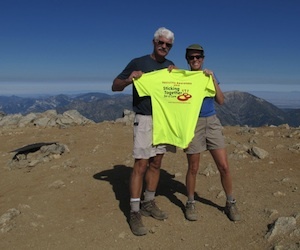 EYE: After your diagnosis, many would have backed down from attempting Everest or the Iditarod. What is it about you that makes you just do it? What should we learn from your example? CINDY: You just can’t set any limits. You have to be responsible about it though, too. I’m not going to let a disease control my life; I’m in control of it. I want to make it clear that I do not have a death wish. I want to go home to my husband and daughter very much. But if I do this, I’m going to be the first female to summit Everest and finish the Iditarod and the second person in the world to do it. It’s surreal except when I’m out there doing it. That’s when I switch to my task orientation, and I put all feelings and emotion aside. That’s how I get through it. EYE: So you must like dogs and the snow? CINDY: I hate the cold! That’s why I live in Southern California. EYE: After 14 years of physical pain and wondering what was wrong with your health, you were finally diagnosed. Now that you know what you have, is it easier to deal with? CINDY: Absolutely. It was a relief. I wasn’t happy with the diagnosis, but I at least knew what it was, and I could start to deal with it. My disease was accelerating rapidly so we caught it in time to put it in check. Right now, however, I’m not fully “dosed” up on my new medication because I don’t have access to the testing I need, so I’m in limbo. But it’s now or never. 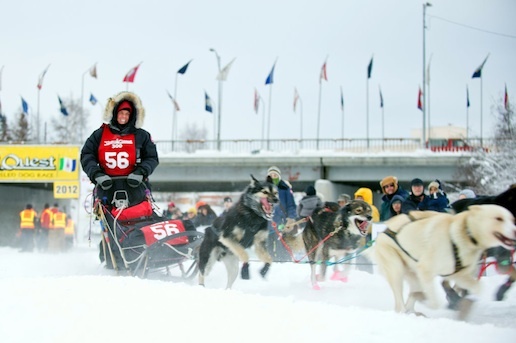 EYE: What is your goal for running the Iditarod? CINDY: I want to run a good, smart race. But my dogs are more important, so I’m going for 11 -12 days and to come in with as many of my dogs as I can. EYE: I became aware of you through Renee Sotile, whom we have interviewed on TWE. She is currently directing a documentary on your story of survival. How are you accomplishing all of this financially? CINDY: It costs $100,000 to train for a year. My husband has pulled money out of our retirement. We have gone into such tremendous debt to raise the level of awareness about my illness and adventures. I probably have about $40,000 of expenses I have to pay for just for the finish of this season. And now we are funding a documentary through my website. It will be something that lives on and maintains the awareness. EYE: This is all worth it to you for some reason. What is that reason? CINDY: My 14 years of going to doctors, having my body basically disintegrating, and everyone telling me, “We don’t know,” when there was an answer the whole time. The National Organization for Rare Disorders can help send people to doctors. I could have been treated sooner, but if I can get doctors and people educated, if I can just let people know that if someone is telling you, “I don’t know,” go to their website. That’s my whole goal—to get people to know about it. EYE: Are you proud of yourself, Cindy? CINDY: Hmmmm. I’m happy with what I’ve been able to do. EYE: Not to jump too far ahead, but what would be the next cool thing for you to do? CINDY: My husband cringes when anybody asks me that. He says, “My wife doesn’t seem to think she doesn’t have any limits.” I’ve always wanted to walk on the moon. When I was 16, I applied to the Air Force Academy to become an astronaut. That would be the ultimate for me! 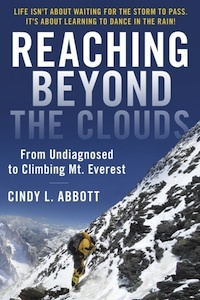 EYE: Talk about reaching beyond the clouds! Knowing what you know now, what would you tell your 16-year-old self? CINDY: My 16-year-old self is the same person that I am today. My family taught me that if you wanted something you had to work for it. Nobody told me you couldn’t or put limits. 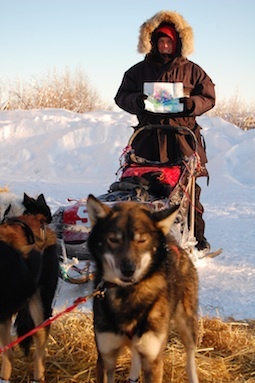 EYE: Will you return to teaching after the Iditarod? CINDY: Yes, I love teaching. I love my job at Cal State Fullerton. I love just looking out at all those faces and telling them the world is for the taking. Whatever you want to do go do it. I work in the Health Sciences Department, and I have the best job; I have the best husband, best family, and the best work support. EYE: Do you think people take life for granted? CINDY: I think people get caught up in what they’re supposed to do or they just don’t try. Then all of a sudden they’re 60. I don’t judge people at all, but there is a whole big world out there and I want to see everything. I am so grateful for my husband because we are soulmates. Somehow I can rally up and do these incredible things. Dog sled racing and being away from family and dealing with the disease and the cold is just so so so hard, but I’m so happy that I can do it. It’s so amazing. When I cross that finish line at the Iditarod, I don’t have any idea how that’s going to feel. EYE: What is the biggest challenge you are facing with this race? CINDY: My vision is not good. When you’re moving in the Alaskan wilderness at dark, during a storm with no trail markers, my vision issue is probably the scariest thing for me. My dogs rely on me. EYE: Well, if there is anyone who can do it, I’m pretty sure it’s you, Cindy! CINDY: I’m pretty sure, too. I have a lot of confidence in myself just because of the way I approach things. Just take this run, keep your dogs safe and healthy and then think about the next run. Do it step-by-step and be smart. EYE: I’ve never followed the Iditarod but I will this year and will be rooting for you the whole way! We’ll check back in with you after you cross the finish line!! Here’s how you can follow Cindy on Facebook.